Woah, it's been awhile since I posted anything to the blog. According to one of my favorite energy alert sources - http://www.thepowerpath.com/index.php/power-path-home/the-power-path/monthly-forecast/572-october-forecast-2013 - October is a month to reset and reboot so I guess it's all in divine order. I spent the past few days in LA, visiting my sister and attending the wedding of a lovely couple, so this week and next I'm going to share some inspirational photos from my trip. I hope they will make your world a little lighter, a little brighter as you reset & reboot. This first photo is the street sign for an organic, vegan cafe called Cafe Gratitude. The original was in San Fran and although I have heard it is now closed, it was the origin of the movie "Let Me Be Frank," which is a great film for anyone interested in transformation. We had a lovely meal there and it was the perfect way to kick off a trip that would contain many opportunities for transformation - some of which I leapt upon and others of which I let slip on by. Such is the life of a human being. 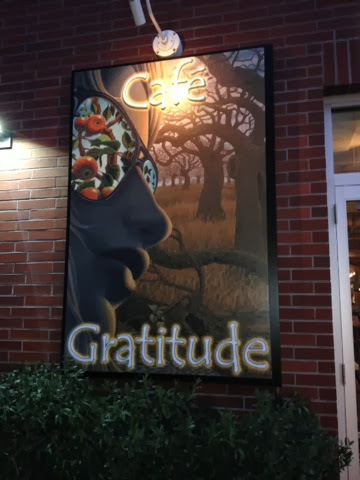 All of the entrees at Cafe Gratitude are an affirmation such as "I am transformed" (which my sister ordered) and "I am humble" (my choice for the evening). As you order they repeat your choice back to you, affirming your intention for the meal ie. "You are transformed." "You are humble." It may sound a bit corny, but it really feels good to have your intention mirrored and affirmed and contributed to an overwhelming feeling of bliss while dining. Highly recommended!